Collectors gather all sorts of things for entertainment--coins, stamps, dolls, toys. Today, however, our culture is very different, and many people have trouble understanding collections and those who collect. This article will put forth several reasons why people might collect dolls. Many people collect dolls that are antiques. 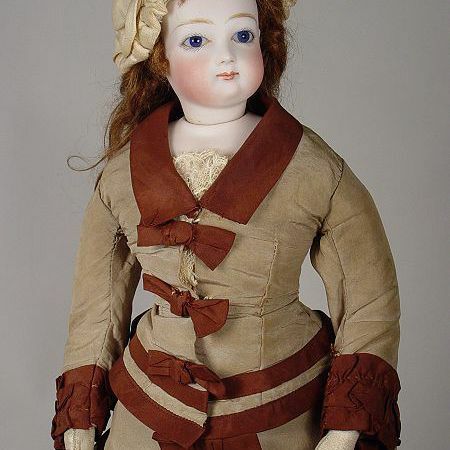 Dolls are some of the most beautiful antiques that are available to antique collectors today, with dates of manufacture ranging from about 1800 through the early 1900s. They are also very accessible antiques--they can be collected with a minimum amount of​ room, unlike antique furniture. They tug at the heartstrings more than, say, antique books or antique tools. Many antique dolls as old as the mid-1800s, such as china dolls, can be collected quite inexpensively. Dolls also fit in beautifully with collections of antique toys, trains, Christmas, 19th-century paper ephemera, and sewing items. Some collectors of dolls love history; the historic place dolls hold in our culture can be appealing in this regard, from Barbie in the 1960s to the manufacture of bisque dolls in France and Germany in the 1800s. These types of doll collectors often will collect the dolls of one time period or of one manufacturer that they have studied and researched. Sometimes, it is a love of fashion that brings collectors to doll collecting. Through dolls, you can collect the history of fashion, either through buying dolls costumed with clothing from many eras, or buying dolls from those eras and places (there is a difference--you can have a Barbie doll dressed in a Victorian outfit, or you can have a doll from the Victorian era dressed in an outfit from that time period. Collecting dolls that reflect fashion certainly is easier and easier on space; full-size 19th Century outfits can be quite bulky--hoop skirt, overskirt, underclothes, shoes, hat, purse, gloves...storage space for one human-sized outfit can fit a small collection of dolls! Also, dolls make perfect tiny models/mannequins for dolls, and there is something charming about fashion writ small. Costuming can encompass anything from fanciful fairy and literary costumes to pedestrian baby doll or children's play outfits on a doll. Many people who come to dolls through costuming interests like to sew. There are a plethora of sewing patterns available for dolls of all types, including American Girls, Barbie dolls, vintage, dolls, antique dolls--nearly any type of doll that has been manufactured in some quantity. It is also fun to find and collect scale-appropriate materials, buttons, trims, and other items sized right to costume and sew for small dolls. The greatest number of collectors come to collecting through their childhood dolls--often, nostalgia for or a love of the dolls they spent their childhood with. Some become a fervent collector when trying to find and replace the lost Barbie dolls of their childhood (by the 1980s, expensive collector items...who knew?). You can often identify the age of a doll collector of vintage dolls by just walking into the room where they house their collection. Many collectors of Christmas antiques and ornaments also collect dolls. Seeing the cross-over appeal is easy--dolls make beautiful displays under or next to Christmas trees. Dolls can often soothe a psychological need or an emotional void. Sometimes, the loss of a child or the inability to have a child or retirement from a career dealing with children can lead to doll collecting. After all, dolls are representations of people. You can often see a therapeutic value or connection with collectors of baby dolls of all types. Dolls can be used to make visual statements and can be used to decorate homes. A single dramatic doll may be a focal point in a home, or an entire room might be decorated with dolls to evoke days gone by. A fashion designer might decorate a room with dolls that show off their designs, or with dolls that serve as creative inspirations. Dolls also make great, potentially useful, decor in sewing rooms. Collectors sometimes inherit the beginning of their collections from a mother or grandmother. There can be no intention to start collecting themselves; they attempt to sell a collection, learn a bit about the dolls, get fascinated, and next thing you know, are adding to the collection instead of selling it. Sadly, just like with anything else that can be collected in great quantity, some doll collectors hoard dolls. This is a very small percentage of doll collectors, but it's an inevitable reality. Face it, many dolls are cute; the "cute" factor is very appealing to some collectors. They may be a hard-hitting corporate executive, with a high-tech house and all the latest gadgets, but their only "cute" fix is when they get to play with and collect dolls. Finally, dolls intersect greatly with today's culture of celebrity worship. Many of the best-selling dolls are celebrity dolls, created in the likeness of popular celebrities--singers, actresses, dancers, and even reality TV stars. If a person absolutely loves a particular celebrity and there is a doll of that celebrity available, a new doll collector may be born!